On December 17th, 2010 a street vendor selling produce was stopped and his cart confiscated by police ostensibly for not having a permit. Mohamed Bouazizi was a 26 year old university graduate, who like an estimated 25% of Tunisia was unemployed. After lodging a futile complaint he doused himself with gasoline and immolated himself, like Queen Dido, in front of a government building. His death in hospital on January 4th sparked countrywide protests which has forced the President of 23 years, Zine El Abidine Ben Ali, into exile as of January 14th, 2011. Here’s a helpful timeline of events. For many in the West, including myself, Tunisia, the ancient land of Carthage, is not familiar. 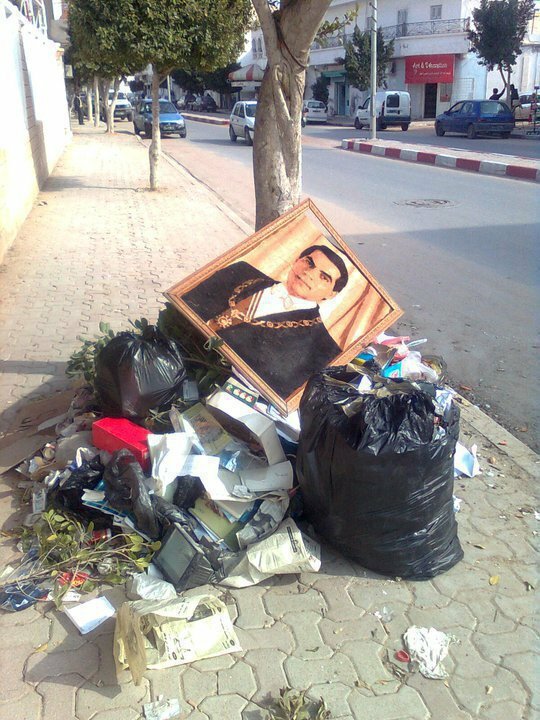 Wresting control of the country in a 1987 political coup, Ben Ali’s presidency was an authoritarian and corrupt one (as this WikiLeaks cable demonstrates), ranked 144th out of 167 on The Economist‘s 2010 Democracy index, and typical of those types of regimes, his giant posters were ubiquitous on the sides of buildings and billboards across Tunisia. He was also, like Egyptian strongman Hosni Mubarak, a valued secular American ally in the region. Its next door Maghrebi neighbor to the west, Algeria itself witnessed riots over a sharp spike in prices on foodstuffs from January 5th to the 9th, resulting in capitulation from Algiers along with a brutal crackdown. The so-called “Jasmine Revolution” in Tunisia has led to a flurry of speculations (another example here, and another here, and so on…) for its ramifications of a possible domino effect towards other Arab autocracies throughout North Africa and the Arab Middle East. Regimes as far away as Syria are heavily censoring coverage of the Tunisian uprising, and Jordan has experienced its own protests over similar ailments affecting the rest of the region. Even the Palestinians are inspired. But it appears the Tunisian model is also relatively unique, in that it was led not by Islamists, but by the youth, the unemployed, labor unions, artists and educated sectors of the population such as students and lawyers, the latter of whom 95% went on strike. Egyptian media is confident it will not be duplicated there, even after a transparently fraudulent election in early December 2010 was met with outcry and limited unrest, or after sectarian upheaval resulting from the Alexandria bombing of a Coptic Church on January 1st. Given the repression and strategically crucial massive economic backing of the United States, they are probably right. Hosni Mubarak will survive, and the true test will be the predicted handover to son Gamal Mubarak in coming years. But the question remains, why was Tunisia so off the radar of the American media? To observers familiar with the nexus between a nation’s official foreign policy and its media (whether state run or corporate), it will be no surprise why Iran got so much attention, and Tunisia didn’t. Nor is that to suggest they are equal. Even so, Josh Shahryar registered his disgust with the neglect of coverage and noted the impact of much maligned social networking in the Tunisian uprising (18.6% of Tunisia uses Facebook). Indeed, for anyone following, as I was, new YouTube videos came out nearly every day. There is no official report on the death toll sustained during violent clashes but they could easily exceed 50. At numerous protests gunfire was recorded, and while the body of the Ben Ali regime is still too warm for an autopsy and the future of Tunisia uncertain as I write this, it was not without its martyrs – even allegedly including children. On the 14th, Prime Minister Mohamed Ghannouchi, a Ben Ali appointee dissolved parliament under his final orders and claimed interim powers after Saudi Arabia acknowledged Ben Ali was there. Tunisia’s Constitutional Council met the day after on the 15th to declare Ben Ali’s departure permanent, and has instead appointed the erstwhile president of the lower chamber of the Tunisian parliament, Fouad Mebazaa, to be the rightful interim executive. Elections were promised in six months’ time, and now in two. The last presidential election was in 2009 with Ben Ali garnering 89.62% of the vote, and legislative elections were last held in 2004. Ghannouchi issued a stiff warning to continuing protests and the crackdown stays in force. A video of the army arresting a police chief also makes me question the military’s role to come. Tunisian expert Dr. Hakim Darbouche is optimistic, but I’m not sure this is the end of the story for the Jasmine Revolution just yet. And domino effect or no, the Arab world’s “most stable nation” being toppled in only a few weeks time can’t help but send powerful shock waves throughout the Arab world, even if they be only psychological. As for the US government’s role in this? Aside from the appropriate steps of summoning the Tunisian ambassador over concerns of violence against protesters and free assembly, a travel warning, and President Barack Obama’s statement, it has been best to keep a hand’s off approach to this, in my view, whether or not it was done out of cynically tacit support for the departed Tunisian dictator, measured caution and support for the grass roots movement — or as happens in Washington, a calibrated combination thereof from a myriad of analysts’ opinions. Bottom line, it’s not always about us and sometimes the best way to help countries like this democratize is to stay out of the way (as opposed to Gaddafi giving his bizarre opinions of hallucinating animal rioters, WikiLeaks’ “lies” and bemoaning the loss of his friend Ben Ali on Libyan TV, via Al Arabiya). Let us talk mostly of what this means for Tunisia and the region. Mohamed Bouazizi didn’t set himself and his nation on fire for America. It was for Tunisia. And, perhaps, that is the final answer to why the American media couldn’t have cared less. Photo by marcovdz, taken in Marseille, of expats celebrating Ben Ali’s departure, Jan 15th, 2011. Best live report I’ve heard. In Tunisia, Are Sisters Doin’ It for Themselves? Tunes tunest va Iran natunest. With respect to Egypt, which, as your question implied, like many countries in the region, has been experiencing demonstrations. We know that they’ve occurred not only in Cairo but around the country, and we’re monitoring that very closely. We support the fundamental right of expression and assembly for all people, and we urge that all parties exercise restraint and refrain from violence. But our assessment is that the Egyptian Government is stable and is looking for ways to respond to the legitimate needs and interests of the Egyptian people. I’d say it was a day of anger, alright. Yes folks, I knew protests were planned on ‘Police Day’ today but admit I am surprised they have amassed so many people. I’m, right now, catching up on everything. They even destroyed one of those water cannons! They did? Well good for them. People here should be ashamed, sitting back and letting this country fall by the wayside. CNN was covering the situation in Egypt. They had a reporter that was on the scene and was talking about the situation. He said 40% of people either in Cairo or Egypt as a whole live on $2.00 a day. Is that what it will take for Americans to stand up and say No More? I am amazed at these peoples’ bravery in light of the society they live in. The reporter said Egypt is pretty lenient in allowing speech but I am still amazed at these peoples’ courage. Flipping around the cable “news” channels and I have heard that Rham is back on the ballot 10 times, Congressmen will be holding hands tonight-16 times….But barely a word about Egypt. This is huge, it could be the Berlin Wall in the ME! I’ve been flipping, too, b’ito, and there’s nothing. Gonna try Al Jazeera now…nope. They’re talking about worldwide increases in longevity and how it affects social/financial policy. Interesting. And not fluffy. k’es, Al Jazeera is supposed to be broadcasting live there. I feel silly having to ask this, but are there different “versions” of Al Jazeera, b’ito? k’es, there was a tweet saying that they also stopped covering Egypt. Seems everyone thinks if it’s not covered it never happened or it will just go away. Looks like it will be up to FB, Twitter and U-Tube for anything close to live coverage. 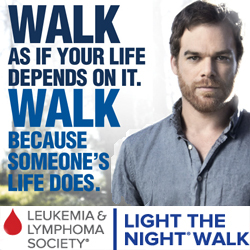 I’m trying to put up some good tweets with links on our Twitter page. Nothing like revisionist history in real time, eh, b’ito? This really drives home the point of how thoroughly we’ve all always been manipulated throughout history by whoever happened to be able the control the story. Until the internet. No wonder “they” all over the world would love to control it! Impressing upon the public their keen grasp of priorities, their Number 3 story is, “Taco Bell Isn’t All That Meats the Eye”. There is no mention I can find on Fox as of this posting of the protests in Egypt. Wonder why and whose side their rooting for, tyranny or democracy? According to AlJazeera: 30,000 protesters in Tahrir, 30,000 protesters in Suez, and 20,000 protesters in Alexandria. Tahrir is “Liberation Square” and there seems to be a movement for everyone to go there. Police have blocked all car traffic to the square. Wow. This is amazing…I am fascinated to see each development! As I noted this morning on MB, AdLib, I have to give a tip of the hat to Khirad, who had said, quite a while ago: “Watch Tunisia!” He had a sense --early on-- that there could be a domino effect in the entire region. This is a sight to behold. You’re so right, Khirad never fails to amaze me with his incisive perspective. Looking forward to his thoughts on what’s unfolding now in Egypt! Rumor on #Egypt is that some police are protecting the protesters and the Army troops are in charge. It’s almost hard to keep up on twitter. Fast food places are giving out free food and drinks to protesters. This is a full-fledged uprising, not just in Cairo but around the whole country. This is at 9:00pm, what will it be during daylight hours? Wow! And who would have thought Twitter would have ended up being such a pivotal tool in movements for democracy? One thing at a time though. The citizens of Egypt deserve the full support of Americans right now to take back their nation and have a legitimate democracy (instead of the current fraudulent one). Twitter and literally thousands of cell phone cameras and other recording devices, along with YouTube, no, AdLib? In the olden days, it might have been easy enough for government thugs to grab a newspaperman with a still camera and smash his equipment, or knock out a TV camera. But now there are almost uncountable numbers of “reporters” who only have to post online to get a world wide documentation of any given event. Citizen journalism to the umpteenth power. Two blogs from this mornings GlobalVoices that caught my eye. Are we -- Arabs -- racist? It’s really hard to tell. Some might argue that racism is against our religion, and that people are never discriminated against because of their skin colour. On the other hand, other tiny aspects of our lives might prove that we are. It seems to be normal, for instance, to make fun of black people [Ar] in the cinema, and even call a candy “The Slave’s Head” because of its colour. Tunisian Mohamed Bouazizi burnt himself to death in protest against unemployment, sparking an uprising which brought down the rule of Zine Al Abidine Ben Ali’s 23-year-old regime in less than one month. Since then, up to 10 cases of self-immolation were reported in Mauritania, Algeria and Egypt, where people are protesting against unemployment, the rising cost of living and corruption, among other grievances. Self-immolation is petrifying and should not be celebrated under any circumstances. But to call those who commit suicide in protest against humiliation, poverty and unemployment an infidel is the most disgusting thing anyone can do. And by god the Saudis are some of the worst, but they’re racist against South Asians throughout the gulf, as well, etc. Of course, Persians are in turn racist against Arabs. Ben Ali’s Ferrari gets the forklift treatment. And, more protests against the ruling party today. For French readers a wall chart of the Ben Ali & Trabelsi clan. A protest of about 700-800 continued in Tunis. The police seem to be behaving and the protesters are chanting “Parliament and a new Constitution”, “Revolution against the remnants of Ben Ali”, and “Ben Ali’s Party go”. More on Tunisians new found freedom. And what next? A panel discussion including returned exiled opposition leader Moncef Marzouki. The sister of Ben Ali has died of a heart attack. Foul play? And ElBaradei now supports a planned peaceful demonstration in Cairo. 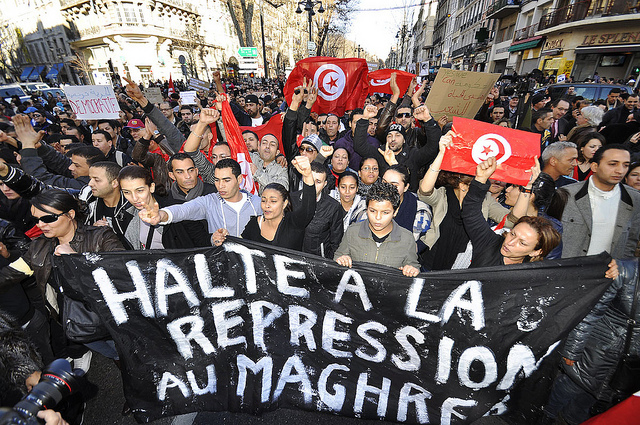 But by toppling their dictator, Tunisians are only halfway to realising their aspirations for genuine reform. The despot is gone, but the gigantic police state that has grown since the country’s independence from French occupation in 1956 is still very much alive. The apparatus of repression laid down by Habib Bourguiba, Tunisia’s charismatic “founding father”, was fine-tuned by the general who inherited it. Dismantling such a monster will not be easy. That is the challenge Tunisians have to meet to complete their revolution. Who are the Opposition Leaders? 4, some reports sat 5 ministers have quit the new sham interim government. Al Jazeera says only three. Brian Whitaker writes of the so-called “new” “unity” government, which looks a lot like the old one. In what appears, but may not be related to, stemming the effect of “Tuniziation” Kuwait is getting mighty generous. Sudanese Islamist opposition leader called for an uprising and was arrested. And more reports of of a couple self-immolations Egypt and now even women can be counted as one set herself ablaze in Algeria (making it the seventh there alone). If you missed Kalima’s link in Morning Blog, this is what I was alluding to as I was writing this article in near real time to Gaddafi’s speech. And heck, could this even spread to Central Asia? Also an exiled opposition leader has entered the country and intends to run for president. Oh yeah, and the tear gas being used against protesters? It’s from Saltsburg, Pennsylvania’s Federal Laboratories, of course.